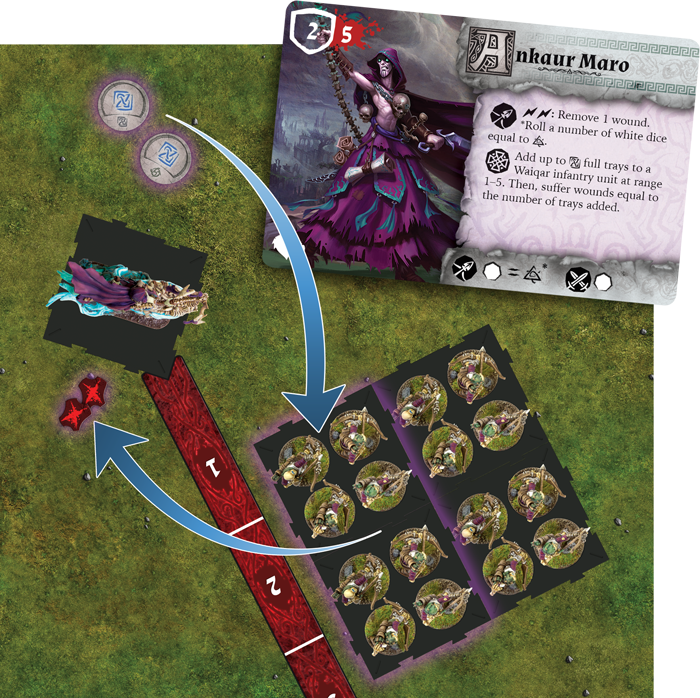 FFG posted a teaser article a few days ago for Ankaur Maro and I decided to sit down and really try to think about how the man will work in game. The box seems to come with two different versions of the Akaur Maro model. I'm assuming that the foot version is for putting into a unit while the other version is for running alone. I'm a little mystified as to why they'd bother include a tray for the foot version. It doesn't seem strictly necessary or even useful. The cavalry version is really dynamic. He's riding on a bone horror, which is a enemy unit from the Descent board game - a game set in the same shared universe. Maro has only two defense, which is the lowest we've seen for a hero, but also has five health, which is the highest. The added health is going to be super useful when you look at his skill ability. He can take X damage to add X full trays of models to a Waiqar Infantry unit... which right now means Reanimates or Reanimate Archers. X is the number of red runes, I think. The actual icons are super similar and I don't have the tokens near me right now. During a ranged attack Maro can spend two surge icons to regenerate a wound. I guess if you play your cards right and keep him out of line of sight, you'd be able to skill the first turn, attack the second, skill the third, and so on. 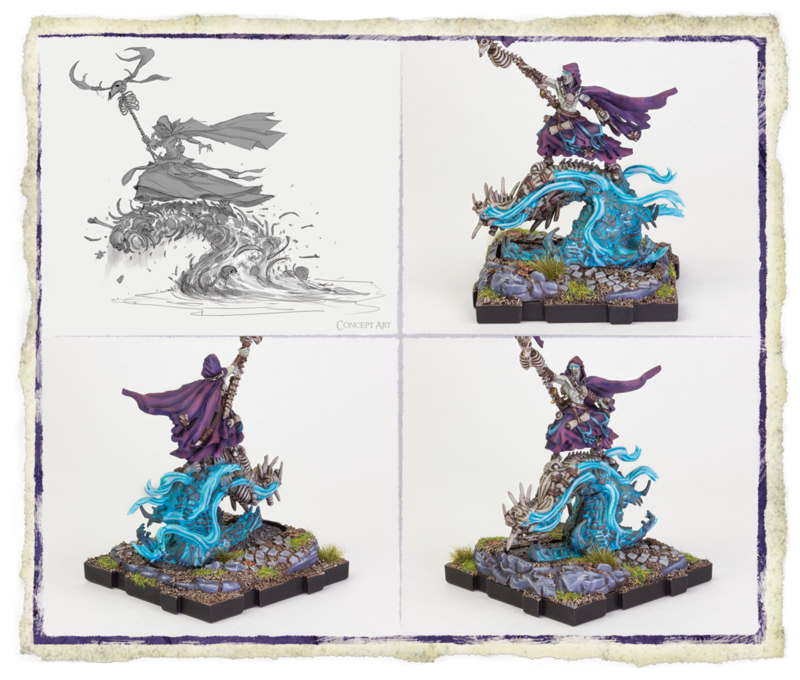 His 'Forbidden Lore of the Shadow Council' allows him to take 1 non-unique unit from any other faction at the cost of that unit starting with two blight tokens. Can you say Oathsworn Cavalry? I can. He's 40 points base, which is pricey... but he'll be offsetting those points with new trays of Infantry pretty quickly. 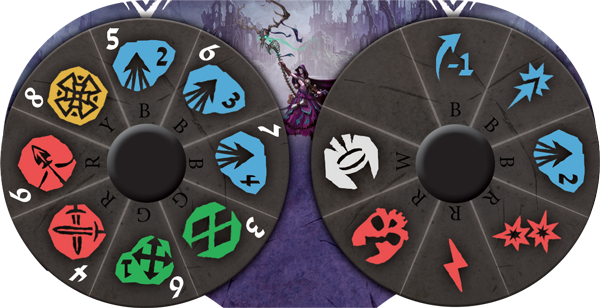 On first glance, Maro has an absolutely amazing dial. And then you realize that he doesn't have Brutal or Precise and may not be rolling any dice at all. He rolls a number of white dice based on which runes are visible. I think what really shines are the red modifiers. If you give him Brutal 1 via an upgrade and roll 1-2 red dice, it's very possible to do 6-8 damage during a single ranged attack. Realistically, though, I think you'd take the free surge and attempt to regen a wound. This picture shows his ability in action. With two blue runes showing, Maro uses his skill to add two full trays of Reanimate Archers to an existing unit, but takes two wounds in the process. 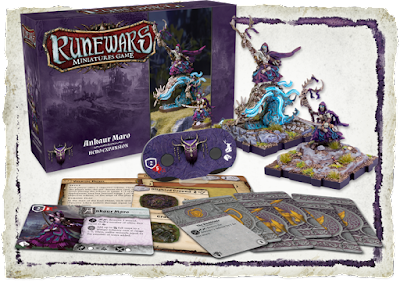 Those Reanimate Archers are worth ~18 points for two trays, so I think you'll be earning your points back pretty quickly. The kit comes with a couple of Ankaur Maro only upgrade cards. The two shown below are mutually exclusive. You can take one or the other, but not both. Violent forces changes the rune colors for your skill and adds Brutal 1. 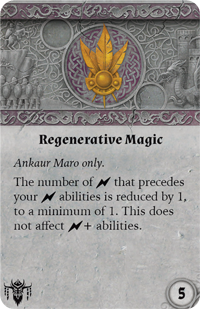 Regenerative Magic would mean that Maro regens a wound on a single surge, which you can guarantee by taking the red surge modifier. I think it depends on how you want to run him. Regenerative Magic would make him relatively hard to kill, but Violent Forces will add more trays, more quickly. It could also make him tougher in combat. Red can easily have zero runes on the table. Blue always has at least one. 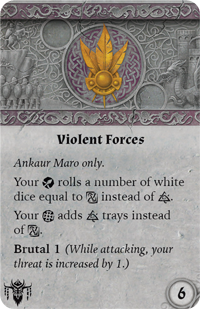 Violent Forces would therefore make Maro more reliable, but would also kill him quicker as he spawns more trays. Hard to tell. There are a couple more upgrade cards that we haven't seen yet.